After the clearing of the percolation pond the number of Eurasian Coot decreased to zero but yesterday I saw my first returning bird. The reeds are already starting to grow in very small patches and it is enough to attract back six Common Moorhen and one Eurasian Coot. 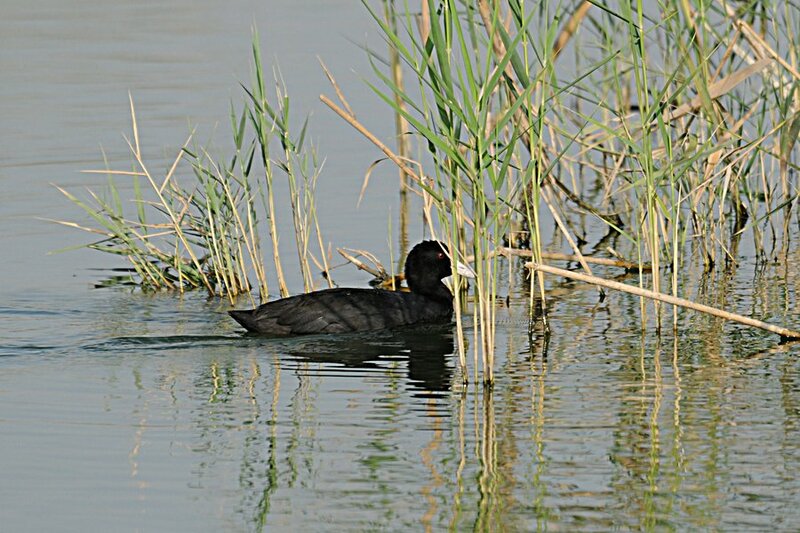 The birds are quite easy to see now as there hiding places in amongst the reeds has been destroyed so they are now spening much of the time resting in the open. Duck numbers are also increasing with 25 Eurasian Teal in amongst the sparse reeds and a Common Sandpiper. A minimum of 500 Great Cormorant made a spectacular sight flying around before going to roost. Three Western Cattle Egrets and two Grey Herons were also present in the late evening ready to roost in the surrounding trees. A single Barn Swallow was flying around the pond and a Eurasian Sparrowhawk was living up to its name by chasing the small House Sparrow Flocks. Three Indian Silverbills and three Eurasian Skylarks flew over calling and at least six Chiffchaffs were in the trees surrounding the pond. The best birds, however, were two Great Crested Grebes, which is the first time I have seen the species since March last year. There is unfortunately no suitable habitat for them to breed on this year.